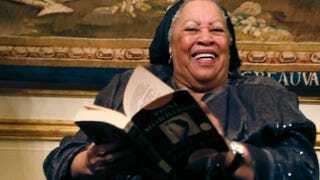 Toni Morrison, who celebrates her 85th birthday today, has always enjoyed using her immense talent with words to write about blackness. Her entire writing career—which spans over four decades and includes more than enough books to fill your shelves—has not included the white experience or privilege. In an interview with Charlie Rose, Morrison discussed the way she felt when she was interviewed by Bill Moyers and he asked her when she would write about white people. She said that she will not privilege white people; nor will she explain things to white readers. "Yes, I can write about white people; white people can write about black people—anything can happen in art. There are no boundaries there. … Having to prove that I can do it is what was … insulting," Morrison told Rose. "If I can say, 'When are you going to write about black people?' to a white writer—if that's a legitimate question to a white writer—then it is a legitimate question to me; I just don't think that it is … ," she added. "I couldn't ask that of any writer." Morrison has never believed that black writers have to engage with white characters or the white world in order for their writing to be legitimate. She told Rose, "Maybe I am responding because I have had reviews in the past accuse me of not writing about white people. I remember a review of Sula, in which the reviewer said, 'This is all well and good, but one day she will have to face up to the real responsibilities and get mature and write about the real confrontation of black people—which is white people.' As though our lives have no meaning and no depth without the white gaze. I've spent my entire writing life trying to make sure that the white gaze was not the dominant one in any of my books." "I'm writing for black people," Morrison told The Guardian last year, "in the same way that Tolstoy was not writing for me, a 14-year-old colored girl from Lorain, Ohio. I don't have to apologize or consider myself limited because I don't [write about white people]—which is not absolutely true; there are lots of white people in my books." So … bloop. Check out the clip.